Choosing the right sized Direct-Fired Crack melter is an important business decision. There are many factors that play into purchasing the right melter. A few options to choose from when purchasing a kettle are the 10 gallon, 30 gallon, and 55 gallon capacities. All these melters come with some form of agitation. The most economical units come with manual sweep agitation, which essentially relies on the user to “rock” the arm of the agitation system back and forth. This allows the arm to move around the molten material inside, which carefully avoids ”cooking” the polymers out of the material. 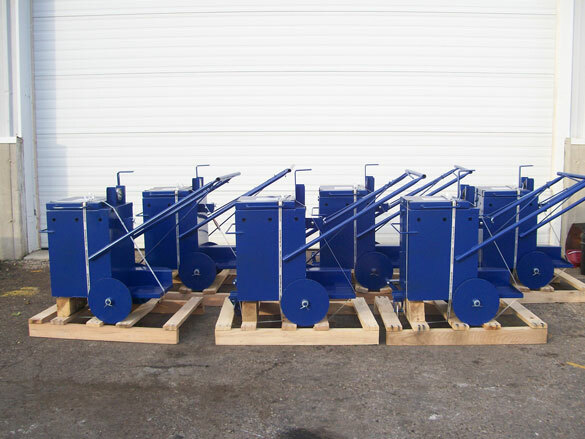 Stationary melters may be truck or trailer mounted and the user has different means to apply the material. They might be using a 4 gallon bander box or smaller pour pot and striking the material off with a crack squeegee. Both methods of application have their advantages. Crackbanders are also called speed banders because of the speed at which you can apply the material. Putting down the material with a pour pot and squeegee is cumbersome, but the control you have applying the material can be considered an advantage. On a driveway, no one wants to look at a 3″ band, or “snake,” banded over the top of every crack in their driveway. The pour pot and squeegee method requires a two man operation. One man operates the pour pot and monitors the amount of material released. The other follows along with the squeegee, forcing it down into the crack and striking off any heavy build up. Cosmetically speaking, this might be the better option. As for the performance of the material, some argue it’s better to leave more material behind. We’ll touch on this issue in a future blog or article. The other option is a melter/applicator. This machine not only melts the material, but applies it as well. This unit typically comes in a ten gallon machine. These units are prettty handy. One complaint we have fielded on these machines is are that they take about 30 to 45 minutes to heat up to a suitable application temperature(so do the stationary melters). A lot of our contractors make sure the torch is lit and placed in area that is safe and where it will not go out. An operator usually will do something else in close proximity to the machine while it is heating, checking on it often. Once heated, the operator controls the material flow and the screed while maneuvuring the machine over the crack. This is a fairly simple method to apply. The other issue pertaining to MA-10′s is the build up of carbon or other matter, which can form a clog in the valve. With simple maintenance, this problem can be avoided almost entirely. Often times our contractors will use both a stationary melter(as a premelter) and an MA-10 to apply the material. In the world of Direct Fired Melters, this seems to be the most efficient method used on parking lots and areas where the extra capacity is needed. In terms of which melter is right for you, there are a few considerations to take into account. First, you need to consider how much room you have on your rig, and whether it is mounted on a truck or trailer. You only want to purchase the size of melter that will fit in the space allowed. Second, you should consider your typical scope of work. If you’re a contractor that does only residential work, a 10 gallon mini melter or an MA-10 might work best. If you do mostly residential but dabble into some commercial work, you may want to look into a 30 gallon melter. If you do mostly commercial, a 55 gallon melter might be your best option. Your budget also may play into your decision as well. Direct Fired melters purchased new are anywhere from $625-$1200.00. Keep in mind that stationary melters also require the purchase of a Crack Bander (approx $350) or a Pour Pot (approx $110). Ultimately, the decision when buying a direct fired melter falls on the purchaser. Bigger isn’t always better. However, you also want to consider growth in the process. If you’re a driveway contractor today, but you are aspiring to do more commercial in the future, you might be looking more for a 30 gallon melter. Any melter you choose will get the job done. Signet Pavement Supply attempts to fit each of our contractors with not only the best melter to get their jobs done, but more efficiently as well. Visit our webstore coming this April @ www.signetpavementsupply.com for the best deals on all Direct Fired Melters in our Crackfilling Equipment category.